There are social rides (not associated with the club) for both road and mountain biking at regular times throughout the week and all rides gather and start from CyclePath (74 Gavan Street, Bright). Keep your eye on the Bright Cyclist Facebook page for all the banter and updates when it comes to these local rides. 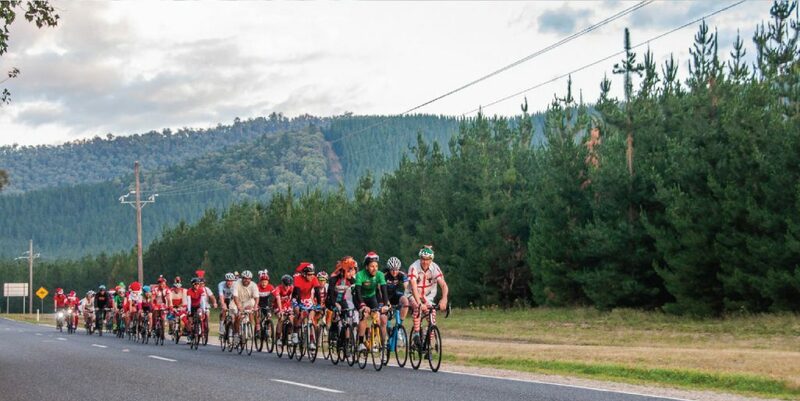 For club run rides follow the Alpine Cycling Club’s Facebook page and sign up to our Newsletter. Bunch ride – not associated with the club, but an opportunity for members and visitors alike to ride together. Some easy, some hammerfests. Watch out for the sprint & the 60k speed sign sprint back into town. See if you can stay with the mountain goats up the hills. The bunch always regroups – no one is left behind. Bunch ride – not associated with the club. Up to the top of Tawonga Gap and back to Bright about 7:45am. Group ride – not associated with the club. Everyone’s welcome and depending on the numbers can split into 2 groups A and B depending on how fast you want to ride. The famous Murray to Mountains Rail Trail starts in town and runs all the way to Wangaratta with a side trip up to Beechworth. See the Murray to Mountains website for more info. Out to Porepunkah and back. An easy ride to historic Wandilligong. Vist Australia’s largest hedge maze while you’re there. One of the prettiest rides in the region with impressive views of Mt Buffalo. A circuit out over Rosewhite Gap and return via Tawonga Gap. Probably the easiest of the mountains to climb with fantastic views from the top. Falls Creek itself isn’t too hard but you have to go over Tawonga Gap twice. Over Mt Hotham to Omeo then back via Falls Creek and Tawonga gap. Includes the dreaded Back 0’Falls climb.